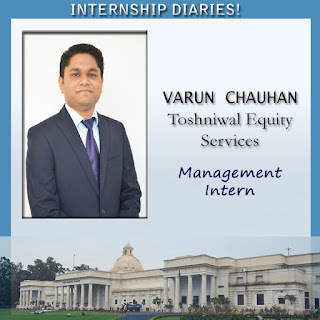 I did my internship with Toshniwal Equity Services which is a stock broking and investment consulting firm located right in the heart of Dalal Street and Bombay Stock Exchange. Internship started with a lot of expectations from our mentor and CEO of the company Mr. Jay Toshniwal. We were expected to work not only on financial aspects but also consult on minor but vital aspects of the company like operations and marketing. The title of our project was Financial Statement analysis and Stock price movements. First week started with through learning of broking operations. In this we learned about how the flow of information/order happens from a retail customer to other retail customer via exchange and vice versa. We were amazed to know the robustness and fool proof check measures enforced by sebi and exchanges. Also we got to know deeper insights into the stock markets. We always reckoned BSE to be bigger than NSE but actually the position was reverse. In the second week financial aspects of our project started, we understood technical and fundamental analysis of equities. We did our technical analysis on Technical Analysis Software. Many other software are available in the market which provide technical analysis. We were required to make algorithms so that best scrips (stocks) can be retrieved and transaction can be executed on basis of these calls. Fundamental analysis was done of cement sector which included 6 major cement companies of India including ACC, Ambuja, Birla, Heidelberg and Ultratech. Additionally we worked on understanding the management discussions and their interpretation in financial terms. We also gained experience on core corporate operations of the company by attending Annual General Meetings of Reliance and Hindustan Unilever in subsequent weeks. Our next task was analysis of Nifty Junior, Nifty 200 and Nifty from Feb ’15 to July’15 and to come out with stocks which were resistant to such fluctuations. We also worked on updating client portfolios on moneycontrol.com which was an arduous task but this was also successfully updated by us. Our last assignment was revamping the website of the company, which included coordinating with the vendor on all aspects of the website including content and design. The website was successfully revamped with full email access services running all over the company. We also shared our knowledge on how technology can be used to further improve the core operations of the company. This was my internship experience.